For years the mathematics books at Foyles bookshop in London had their own room. It was a strange place, to the uninitiated inexplicably yellow. It had its own quirks rules and legends. There were shelves whose books were not for sale and, should you find a book that was for sale, you had to try to sneak it out if you wanted to purchase books elsewhere before leaving. When I entered the room for the third time I was a PhD student in London. I had the practical purpose of finding a book I needed, but I became entranced. It became a regular place to visit, gaining familiarity and comfort. During hard times in my PhD and later jobs in London it acted as a refuge. At some point earlier memories returned. Old-School Foyles, but not the mathematics room. Do you have an image? Analytic and Algebraic Topology of Locally Euclidean Parameterization of Infinitely Differentiable Riemannian Manifold. Some books I simply gazed at, others I bought simply for the magic of their titles. Those titles echo in my memory. Today some have become trusted friends, some sit mysteriously on my bookshelves having resisted numerous attempts on their secrets, others turn up like old acquaintances when I visit book shops. I did that recently, I was once again in Foyles. The mathematics section had moved once more. It was once again in a familiar room at the front of the building on the third floor. Had they come home (albeit sharing the space)? But wasn’t the old maths room on the second floor? To my shame I could not remember clearly. I had grown used to the room being gone; it was a shock to find the details of my memory so weak. My internet skills failing me, I could not even find a record that gave the floor, worse, I could not find mention of the room at all. So I decided to write this.For me it makes concrete memories that seemed routine at the time, but now hold great importance, but perhaps I am not the only one? Maybe there are others who have fond memories of this room. If you do find this and remember please share your memories of this odd, impractical but special room. I mourn the room, but do realise that some things have to change. Today the nature of the book itself is changing, and with it the bookshop. Just opposite Foyles the space that used to be Borders bookshop is now taken up with TK Maxx. With the ability of the internet to deliver information and, electronic readers finally usable, the paper book finds competition it has never had before. Yet the bookshop, as I adore it, has been under threat for a long time. Borders itself along with Barnes and Noble represented the first assault, opening up the bookshop and making it easy to navigate. Then Amazon opened things up further, making it possible to easily find any book in print. 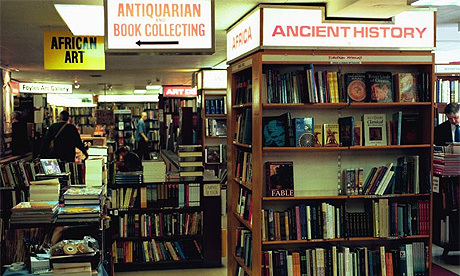 Yet great bookshops, like Foyles, have survived, I have faith, there will be changes, but some of what we love in these stores will survive and perhaps some of what will be lost needs to go. Is it such a bad thing that cheap dectective and romance novels will no longer force trees to be cut for their paper? For the moment therefore I try to regularly visit the bookshops I love and buy books from them. Not just for the books themselves but as a support for those wonderful shops. It makes a good excuse anyway! As a regular visitor to Foyles I learnt certain routes around the building, mixing the stairs and elevators. It felt that a tiny deviation from the correct route could leave you in a different place entirely. It was occasionally a shock to realise that two points, that I had thought were in completely different parts of the building, were actually just around the corner from each other. Terry Pratchett describes this best with the concept of L-space, that all libraries, and bookshops in the world are connected both in space and time and, with the correct path, you can navigate to any of them. In the Discworld version of the burning fire of Alexandria a hairy arm is seem amongst the flames rescuing some of the greatest works. ← Why not knot wire? Remember the woman who you had to take your books to so she could write the receipt which you’d take to the cashier so you could pay and get a stamp which you’d take back to her in exchange for the book? Yes, I can remember putting a lot of effort into sneaking the books out of the room! You could normally buy them normally at the cashier.